European Waterways, Europe's largest luxury hotel barge cruising company, has declared the 2015 cruise season "the year of the family," offering up to 10% off the price of whole boat charters on ten of its most popular hotel barges in the fleet. Since the vessels hold from just 8 to 12 passengers, chartering a hotel barge guarantees a personal, private holiday, with the option to modify family-friendly itineraries to meet the unique needs of the group. "Family travel is one of the strongest growth markets in the cruise industry, with more families opting for unique new destinations and itineraries, as opposed to traditional vacations, such as theme parks and large ocean cruise ships, where families get lost in the crowd," says Derek Banks, managing director of European Waterways. "Although our cruises are perfect for all types of small groups, we want to mark 2015 as an especially 'family-friendly' year for hotel barging. We offer the kind of experiences that are tailor-made for today's multi-generational families, with a wide range of activities that can be enjoyed by young children, teenagers, parents, and all the way up to grandparents." Among the family-friendly activities available on this holiday is a visit to the city of Carcassonne, the most complete medieval fortified city in existence. Designated a UNESCO World Heritage Site, the city transports visitors back to the medieval era, allowing young minds to imagine a time of kings, damsels, and gallant knights. The 6-night itinerary also includes a visit to the unique Meze Dinosaur Park and Museum, the largest museum in Southern France dedicated to dinosaurs. As an open-air exhibit, kids can't miss the massive and realistic constructions that are waiting for them inside, such as the head of the Brachiosaur skeleton, the largest complete dinosaur skeleton in the world, which peers out above the treetops. The National Nature Reserve of Bagnas is another child-friendly destination, where guests can look out for more than 250 species of birds that include flamingos and other migratory birds. European Waterways is offering a 5% whole boat charter special for Anjodi that is applicable to 2015 departures on April 19 & 26 and all departures from May to August and in October. These must be booked by September 30, 2014. A 10% discount applies to the March 29, April 5 and April 12 departures, with no 'book-by' deadline. Following a welcome champagne toast (soft drinks for the children!) on board in the medieval town of Auxerre, the vessel sets a course for the village of Vincelles, where options include a choice of swimming, supervised "go ape" tree climbing for the young, or a visit to Chablis to one of the town's oldest wine cellars and a private tasting for the adults. Among other highlights is a visit to the caves of Arcy sur Cure, a natural phenomenon dug out by the Cure River; as well as cruising past the stunning natural rock cliffs of Saussois, a popular rock-climbing destination. There is also an excursion to the town of Vézelay, where adults can marvel at the Romanesque Basilica of St. Mary Magdalene, while "thrill-seekers" in the group can enjoy a canoeing, or rafting trip on the River Cure nearby. A 5% reduction in the whole boat charter price of L'Art de Vivre is available for the 2015 departures on April 19 and 26 and all departures from May to August and in October. These must be booked by September 30, 2014 to be eligible. A 10% off charter special is also available for the April 12 departure with no 'book-by' deadline. The hotel barging experience is different from large vessel river cruising. It offers a slower paced, "gentle voyage of discovery" along the more intimate canals and waterways of Europe, allowing a small number of guests to become more fully immersed in the culture, history and gastronomy of the region. European Waterways offers vacations in nine countries and carries over 2,000 passengers a year. Founded nearly 40 years ago, they own, operate and market a private fleet of luxury hotel barges with cruises in France, Italy, Scotland, Ireland, England, Germany, Belgium, Holland and Luxembourg. 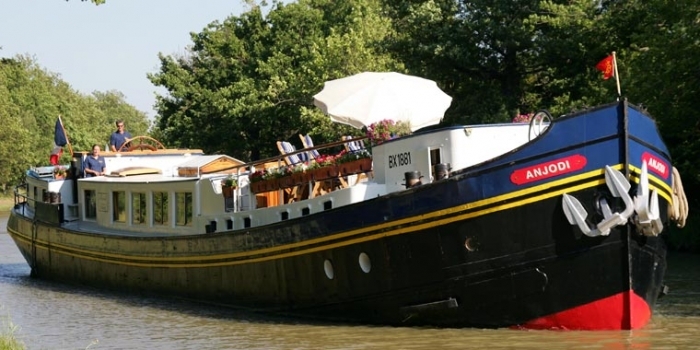 Pioneers in hotel barging, they were the first company to operate a hotel barge on the Upper Nivernais in Burgundy, and the "real" Loire Valley. They are also the only cruise company offering barge cruises in Scotland and in the Venetian lagoon and River Po valley.